Adam Rippon and Mirai Nagasu are looking good at the 2018 ESPYs! The figure skaters and Olympic bronze medalists, ages 28 and 25, respectively, stepped out for the event held at Microsoft Theater on Wednesday (July 18) in Los Angeles. Adam struck a fierce pose in his white top, matching bedazzled jacket, black pants and shoes, and an assortment of jewelry. Mirai shimmered in an embroidered strapless black jumpsuit with an attached skirt and silver accessories. They were joined by Olympic gold medalist snowboarder Chloe Kim, SuperFly‘s Trevor Jackson, and former Gossip Girl star Jessica Szohr. Adam, Trevor, and Jessica are presenting tonight. Chloe is up for Best Female Athlete, Best Female Olympian, and Best Female Action Sports Athlete. Danica Patrick will host the show, which is set to air live on ABC at 8pm ET. FYI: Mirai is wearing Jovani. Chloe is wearing Casadei sandals and David Yurman jewelry. Jessica is wearing Steven Khalil. Trevor is wearing Sean John. Adam Rippon Strips Down & Bares It All for ESPN's Body Issue! Adam Rippon is baring it all on one of the covers of ESPN‘s annual body issue. The Olympic gymnast is one of a handful of athletes taking part in the famed spread, which will hit newsstands on June 29. Also baring it all for the issues are New York Giants running back Saquon Barkley, Seattle Storm point guard Sue Bird, USWNT and Seattle Reign FC forward Megan Rapinoe, Olympic track and field star Tori Bowie, USSSA Pride Infielder Lauren Chamberlain, U.S. Olympic Cross-Country Skier and gold medalist Jessie Diggins, SWNT and North Carolina Courage forward Crystal Dunn, WWE’s Charlotte Flair, LA Galaxy’s Zlatan Ibrahimovic, World Series winner Dallas Keuchel, golfer Greg Norman, LA Dodgers’ Yasiel Puig, Hall of Fame wide receiver Jerry Rice, Seattle Storm’s Breanna Stewart, and Minnesota Timberwolves Center Karl-Anthony Towns. For more from Adam and the athletes, visit ESPN.com. Adam Rippon and Mirai Nagasu have partnered with DSW for a fun new campaign! The figure skaters and Olympic bronze medalists, ages 28 and 25, respectively, teamed up with the footwear retailer to encourage self-expression and staying true to oneself. The duo have been close friends for 11 years now. Four years ago, they were eating burgers on Mirai’s roof after both missing out on making the 2014 Olympic Games. For the new campaign, Mirai suggested a reenactment of that moment – complete with fries and coordinating sneakers! “This is full circle. We’re celebrating! These are celebratory cheeseburgers,” Adam shared. Adam and Mirai will host a free DSW Block Party at the 34th Street store in New York City on June 27 from 4-7pm EST. The campaign will appear throughout the summer across DSW’s social and digital channels, as well as on Adam and Mirai’s social media channels. 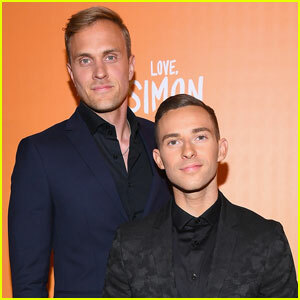 Adam Rippon & Boyfriend Jussi-Pekka Kajaala Make Red Carpet Debut as a Couple! Olympian Adam Rippon made his red carpet debut with boyfriend Jussi-Pekka Kajaala! The pair walked the red carpet together at the 2018 TrevorLIVE New York Gala earlier this week, where Adam acted as a co-host. Adam officially confirmed he was dating Jussi-Pekka back in April, but told E! News they had been speaking since October. FYI: Adam is wearing Topman. 'DWTS' Adam Rippon & 'American Idol' Maddie Poppe Celebrate Their Wins Together on 'GMA'! Maddie Poppe and Adam Rippon share a big laugh together as they posed with their trophies outside of the Good Morning America Times Square studio on Tuesday morning (May 22) in New York City. The 20-year-old singer was celebrating her American Idol win while the 28-year-old Olympic figure skater celebrated his Dancing with the Stars win with his partner, Jenna Johnson, who had the highest combined scores (audience vote, judges) to take the Mirrorball Trophy.